“Mama, why is Ganpatiji called Siddhivinayak?” I overheard a small child asking his mother as we waited for our turn. “Beta, because he is the one who will grant your wish if you pray to him with your heart and soul,” his mother replied. I was lost in thoughts after that, thinking about the charm and purity that this place has in everyone’s heart, so much so that even Bollywood celebrities and politicians make sure to pay sporadic visits to the temple. 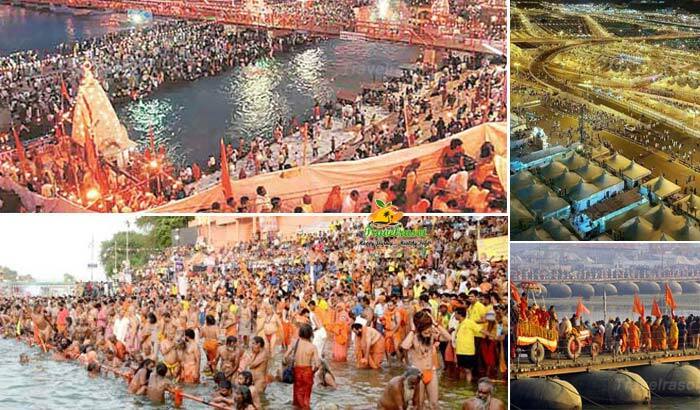 This place must have worked wonders for many, otherwise why would devotees throng this place in large numbers, beating the heat and the rush, just to have a ‘Darshan’ of Siddhivinayakji. It was my first visit to Mumbai and the one place which I really wanted to visit was the Siddhivinayak Mandir. During our 2 day stay in Mumbai, given the amount of work that we had in hand, several plans were made and then cancelled at the very next moment but we decided not to cancel the plan to visit the Mandir. After all it is very rare that you get to visit a place of such sanctity. 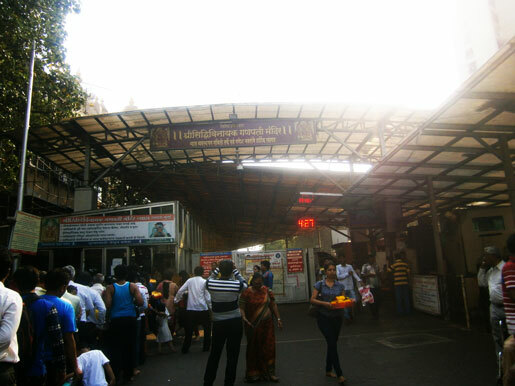 We took a cab from Goregaon to Prabhadevi, where the temple is situated. We were even advised to take the fast local (train) to Dadar station, from where it is merely a 10 mins walk. But considering the paucity of time, we decided to take a cab instead. It was 3.30 in the afternoon when we reached and could already spot a big rush in front of the temple from our cab. We stood for a while looking at it but then decided to go in before the crowd starts increasing. There was heavy security in front of the temple and armed personnel stood guarding the place as a steady flow of devotees moved in and out of the premises. Sensing our inability to locate the ‘mukhya dwar’ (main entrance) of the temple amidst the crowd, a personnel in uniform came up to us and directed us where to go. Standing in the long queue, we were surrounded by a group of men trying to sell flowers and Prasad. With these men screaming at the top of their voices, you just cannot ignore them and have to give in to their requests of buying a ‘prasad ki thali’ from them. In return, you can leave your shoes with them and they will assure to take care until you are back. I opened my purse to pay for the ‘thali’ but the man at the shop insisted on taking the money only after we were back from ‘darshan’. Visitors are also not allowed to take digital cameras or any kind of gadgets inside and have to be submitted at the gate. We submitted our staff against a security deposit of Rs 10 (which is non-refundable though). We were also told that if we were in a hurry, we could even get passes worth Rs 50 and Rs 700 inside the Mandir and can go in for ‘darshan’ without standing in the queue. Rs 700 seemed a tad too much, but we decided to get the passes for Rs 50. Once inside the Mandir, we got the passes and looked around for the queue which was supposed to be smaller compared to the normal one. Now something very interesting happened here. Unable to figure out anything, we crossed a maze of bamboos put in rows and stood in a queue. Seconds later a man who was managing the crowd came to us shouting that when we had paid Rs 50 for a pass, why would we need to stand in the general queue. We both were amazed at this outburst but acted as instructed by him by joining the queue in which we were supposed to be. We both had a hearty laugh later thinking about this incident. As we inched towards the main Mandir amidst the crowd (thankfully this was a smaller queue), a feeling of gratitude to God came to me. As visiting the temple could not have been possible if He had not wished for. Thankfully it was not a Tuesday as the crowd would have been much more on that day (since Tuesdays are considered as the day of Ganeshji). 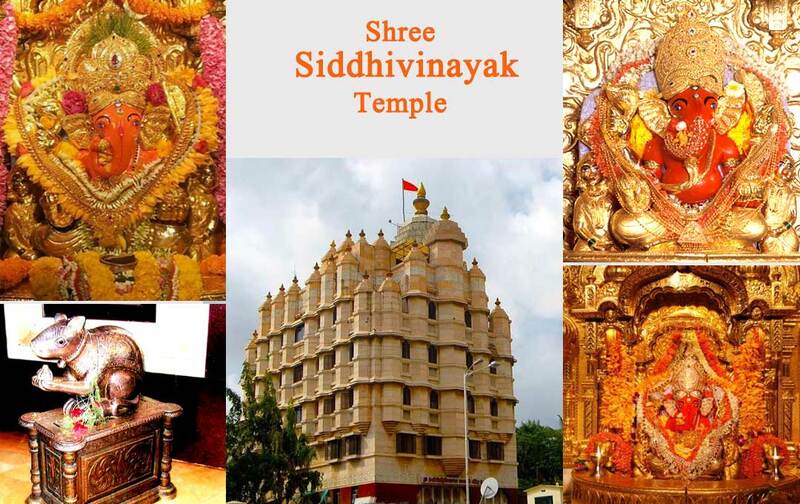 “Lord Siddhivinayak” is well known as the “Navasala Pavnara Ganapati” in the native language. The temple was originally built by a professional contractor, Laxman Vithu Patil with the financial support and instructions received from Deubai Patil in 1801. She was a rich lady of Agri Samaj from Matunga but could not bear a child. 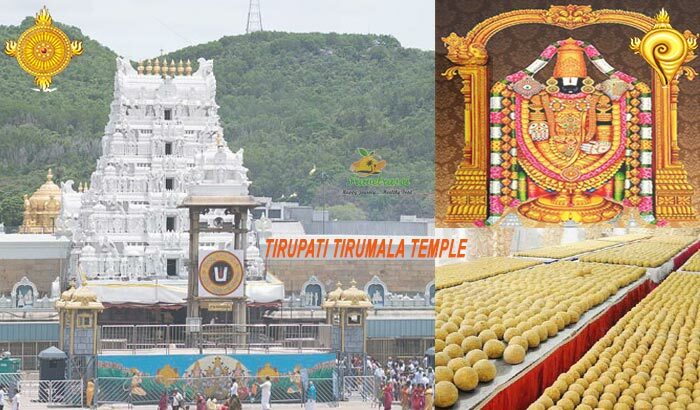 The idea of constructing this temple came to her while praying to Lord Ganesha, with the thought that while she could not begot a child, let other ladies who are childless get the pleasure of becoming a mother on visiting the temple and praying to Him. After offering our puja and taking the blessings, we pushed and pulled our way out from the din to stand in a corner in the entrance and have a glance at Lord Ganesha from outside the main door. It was not possible to do that inside as there was a big gathering. The feeling was most divine and though we could not capture that moment in a photograph (taking pictures is not allowed inside), the image of the beautifully embellished Lord Ganesh is still fresh in my memory. Carved out of a single black stone, the idol of Shree Siddhivinayak is 2’6” (750mm) high and 2′ (600mm) wide with the trunk on the right. The specialty of this Idol is its elephant Trunk that bends towards the Right. The upper right and left hands hold a lotus and an axe respectively while the lower right and left hands hold a rosary (japmala) and bowl full of “Modak” respectively. A snake appears from the left shoulder to the right side of the belly. 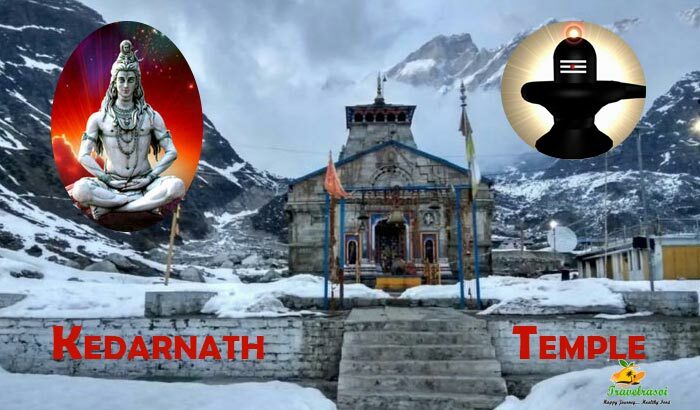 On the forehead of deity is an eye, which very much resembles the third eye of Lord Shiva. The Idol dons a striking saffron colour with a silver dhoti and a gold crown sits beautifully on his head. On both sides of the idol are placed one idol each of Goddesses Riddhi and Siddhi, who appear like peeping out from behind Lord Ganeshji’s idol. “Madamji hatiye. Aap yahan pe bheed jama rahe ho.” A policeman came to us screaming as we stood there watching the Lord. We moved away bowing our heads before Him one last time and invoking his blessings upon us and went in search of ‘Mushak’. Mushak is the silver mouse known as the vehicle of Lord Ganesha and is placed in the centre, sitting just opposite to Ganeshji’s idol. There are 3 such Mushaks placed, adjacent to each other. A group of devotees have gathered around the place; it is said to be auspicious to say something in their ears as the message gets conveyed directly to Lord Ganesha. Though not a believer in such blind beliefs, I however decided to try my luck and pushed myself through the crowd and performed the act of speaking into its ear. As we turned around, we sighted something which found it really amusing. A few devotees were standing before a wall painted in white and scribbling something with their bare fingers. We asked a policeman and were told that writing a wish on the wall is believed to come true. I was really amazed at seeing the people nurturing such a belief and taking turns to write their wishes on the wall. Coming out of the Mandir, we even got sugar free ‘Modaks from a stall inside the premises, just next to the temple. The sweets were really tasty and only after reaching Delhi did I realize that I could have bought more varieties of ‘Modak’s from him. So the next time I visit, I know what all to pick and from where. The visit to the temple was one of the most beautiful memories for me during my Mumbai visit. I wanted to stay a bit longer looking around the place in search of some more interesting stories, but I was reminded of my work and after collected our stuff, we both went out, thrilled at last of having visited the temple. There are also a few souvenir shops outside the temple, offering beautiful statues and mementos of Ganeshji. 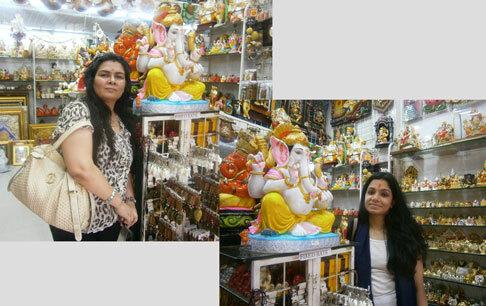 We took out time to visit one of the shops and picked up a few souvenirs of Ganesha to gift it to our dear ones back home. As we waited for our cab, I gave a last look at the dome of the temple; with a cool breeze blowing, it shone brightly in the evening sun, infusing a spirit of devotion and love in every one passing by the Mandir. It is indeed a major centre of attraction in Mumbai. 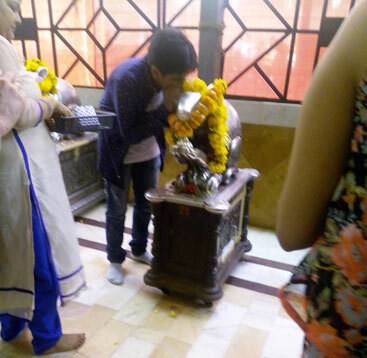 Share the post "Shree Siddhivinayak Mandir – Where Wishes Come True"